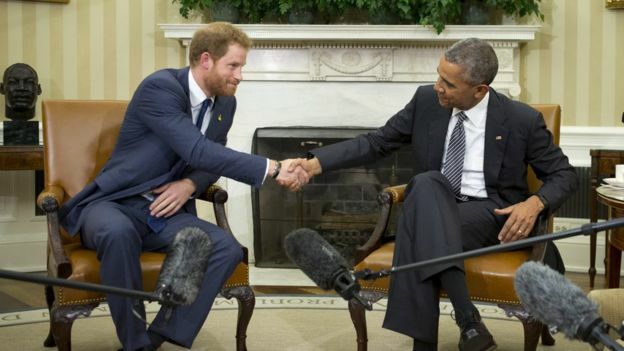 Orlando Attractions Update – Prince Harry has met US president Barack Obama during a visit to the US to promote the Invictus Games. The Games are an international event for injured and sick service personnel. The first Invictus Games took place in London last year, with the next due in Orlando, Florida, next year. The prince met Mr Obama in the Oval Office of the White House for an informal chat. 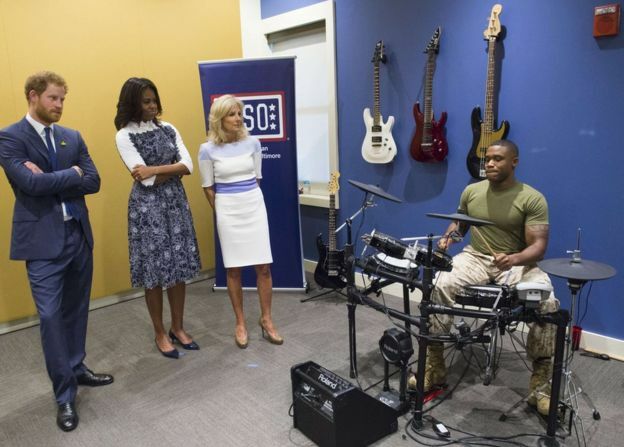 Earlier he joined Michelle Obama to meet injured service personnel in Virginia, and is set to meet Games organisers at the British ambassador’s residence in Washington DC. There were screams of excitement as Prince Harry entered the gym hall. He was here to watch former soldiers in a very different type of combat – wheelchair basketball. 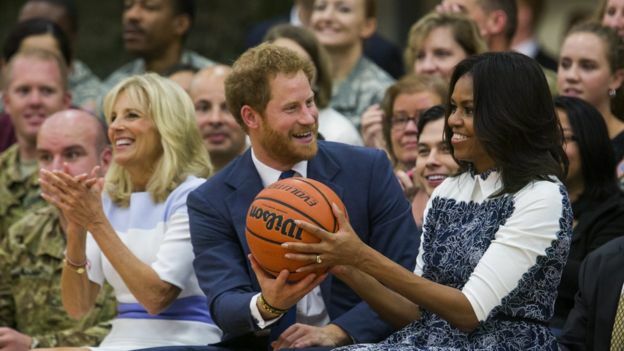 He and First Lady Michelle Obama were glued to the game as the chairs clashed across the court. At one point the prince caught the basketball and handed it to her. The hundreds gathered were told that sport had changed the lives of many injured servicemen. Max Rohn, who lost his leg in Iraq in 2009, said Harry’s support meant the world to him. Sport, he said, gave him the hope he was missing. Prince Harry and the first lady were joined by Jill Biden, the US vice-president’s wife, for a tour of the purpose-built United Service Organizations Warrior and Family Center at Fort Belvoir, Virginia, which supports troops, their families and carers. They joined an art therapy class for veterans then visited a music therapy room. They also watched a sports event before giving speeches. In his speech, Prince Harry said his deployments to Afghanistan “changed the direction” of his life. 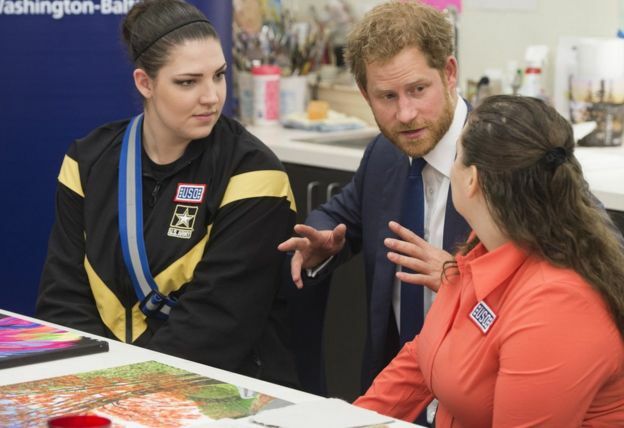 He added: “I hope that Invictus 2016 will remind people everywhere just how incredible our service personnel are, and how much of a positive contribution to society they make. 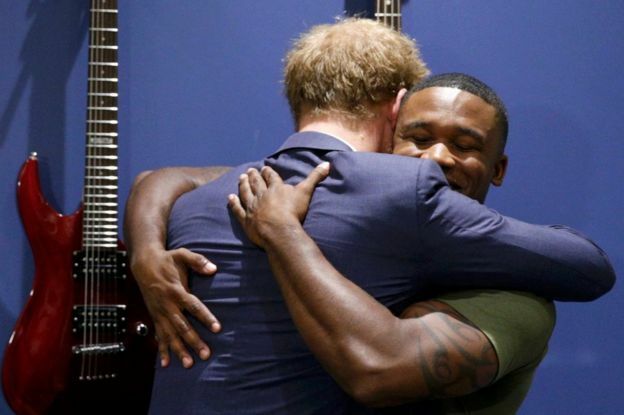 Prince Harry founded the Invictus Games after seeing a similar event, the Warrior Games, held in the US in 2013. He said the aim was to change perceptions of physical and mental injury. “One thing we have to talk about more is breaking down these barriers around so-called invisible injuries, like post-traumatic stress, just as we have for physical injuries like the loss of a limb,” he said.